The stories and sketches in this collection penetrate to the heart of human experience with the passion and intelligence readers have come to expect of Doris Lessing. Most of the piece are set in contemporary London, a city the author loves for its variety, its diversity, its transitoriness, the way it connects the life of animals and birds in the parks to the streets. 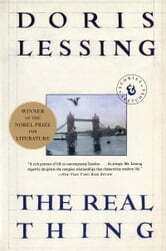 Lessing's fiction also explores the darker corners of relationships between women and men, as in the rich and emotionally complex title story, in which she uncovers a more parlous reality behind the facade of the most conventional relationship between the sexes.